We eat lots of different grains in our house and many of those grains end up being a tasty little salad, whether it be a quinoa salad, buckwheat or millet just to name a few. But lately I’ve been craving a different texture and a different color all together from my grains. The beautiful thing about food now is that we have exposure to some really delightful and really beautiful grains. 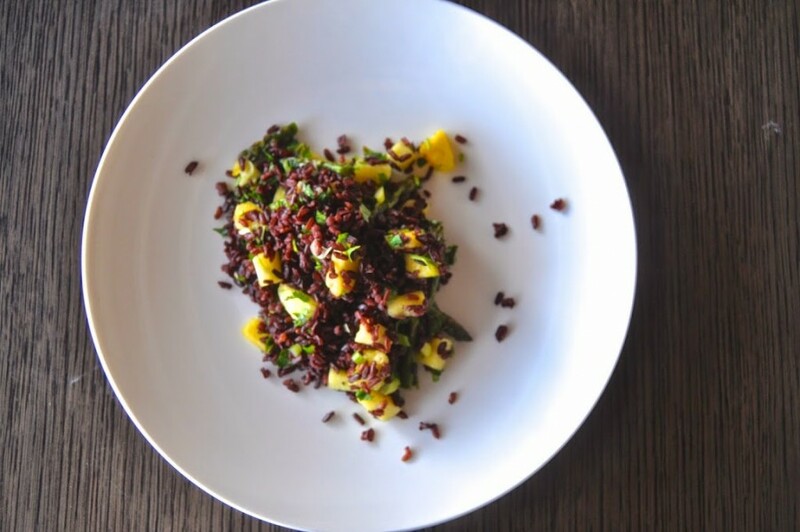 Ancient grains from other cultures that we otherwise only encountered at fancy restaurants or in the countries where they are cultivated. I also live in a city that has the world’s 3rd largest Whole Foods grocery store which means pretty much any item you could ever imagine is within the walls of that building. So I have access to some really beautiful ingredients, one of which is black rice. Oh, black rice, how I have come to love you. Also called “Forbidden” rice, which in my opinion is a much more fun way to describe it, it looks slick and naughty when dry. After it is rinsed and cooked it takes on more of a purple hue but is equally as gorgeous. 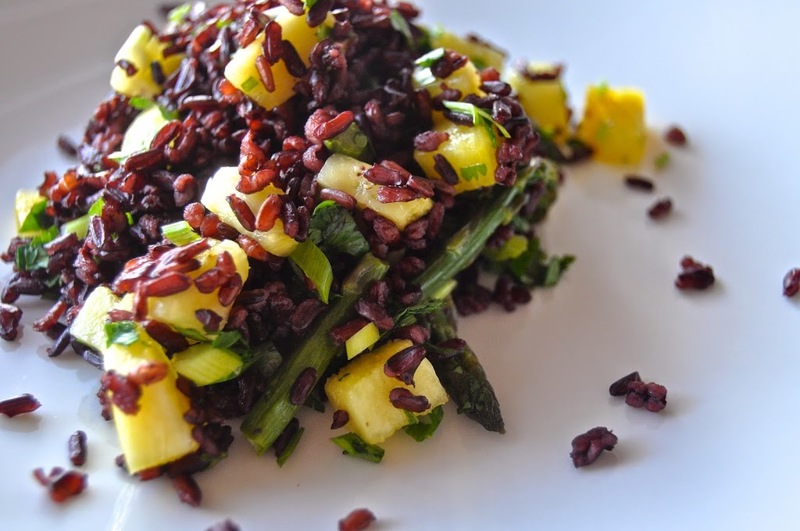 Not only is black rice beautiful but it is also full of some great nutrition. It is full of antioxidant rich bran (which is the part removed from brown rice to make it white rice). This bran houses the antioxidant family anthocyanins which you may know from blueberries, acaí and grapes. These anthocyanins have been linked to decreased risks in heart disease and cancer. So on top of its delicious taste it can give you a nice little health boost, fantastic! And since ancient Chinese legend tells us that the rice was once considered so rare that only emperors were allowed to eat it, feel free to eat this salad and pretend you are the emperor of your kitchen even if just for the day…. 1. Toss all the salad ingredients together and mix until completely combined. 2. Whisk together the dressing ingredients, taste for seasoning and add more coconut aminos or honey as needed. 3. Mix together the rice salad with the dressing and let it sit at least 20 minutes before serving. It might look like you have too much dressing for the rice but as it sits it will absorb the dressing. *to steam black rice first soak it in water for about 30 minutes. Then rinse with fresh water and add to a pot. Cover with twice as much water. Bring to a boil, turn down to a simmer and put a lid on top. Simmer for 20-25 minutes or until it is tender. Pour off any excess water and pour into a baking dish to cool if not using immediately.